John Hickenlooper Recounts the Time He Took His Mother to See Deep ThroatTop this anecdote, Bernie. Speeches and Scenes From John McCain’s Memorial in Washington D.C.Speakers, including former presidents Barack Obama and George W. Bush, celebrated McCain’s life on Saturday. Haspel Nearly Walked Away From CIA Director NominationShe reportedly had to be convinced to stay after worrying she’d be “the next Ronny Jackson” amid scrutiny of her role in the CIA’s torture program. Trump Aide Confirms Trump Wants to #ReleaseTheMemoThe president will undoubtedly support any effort to discredit the Russia investigation. Trump In ‘Excellent’ Health, Says White House DoctorMore detailed results about Trump’s first physical exam as president won’t be released until Tuesday. 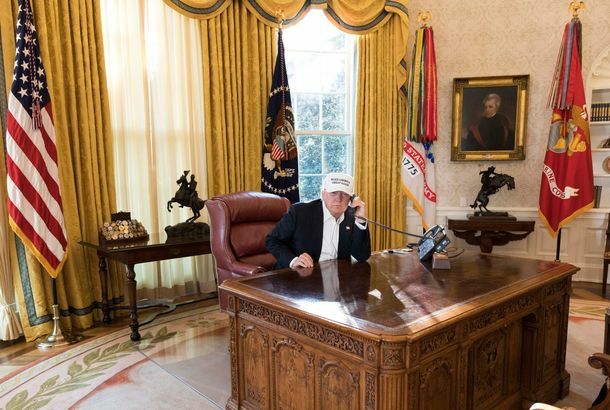 Report: Trump Works From 11-6, Sort OfAnd the president has a lot of “Executive Time” for calls, cable news, and tweeting. Trump Plans to Help More Republicans Lose in 2018The historically unpopular president wants to do a lot more endorsements and rallies to help GOP midterm candidates. Trump Thinks People Should Be Fired for Misrepresenting the Truth on TwitterThe president’s response to a Washington Post journalist’s mistaken tweet sets a new standard for hypocrisy. Mueller Removed FBI Agent From Russia Probe Over Possible Anti-Trump TextsTwo FBI agents who worked on the Mueller probe may have exchanged politically charged messages. Trump Says He Should Have Left UCLA Players in Chinese JailBecause one of the players’ fathers didn’t appreciate Trump’s help. Report: Trump’s Staff Keeps Him Happy With ‘Delusional’ Good PollsHe apparently gets upset when he sees the regular polls. Trump Administration Disbands Climate-Change Advisory PanelYet more evidence that the White House is uninterested in acknowledging or planning for the threat of climate change. Charlottesville Shows That Republicans Are More Willing to Rebuke TrumpRepublicans are continuing to call out the president, this time over white-nationalist violence. Things President Trump Has Condemned Other Than White NationalistsThe president declined to condemn white nationalists on Saturday, but he’s sure summoned the will to condemn just about everything else. Has John Kelly Reined in Trump’s Tweetatorship?Many have tried. All have failed. Pence Denies He Is Already Running for Trump’s Second TermA new Times report says that some Republicans, including Pence, are quietly betting against Trump being willing or able to run for president again.